PersonalBrain (available in a Free Edition, as well as paid editions) is quite possibly most intuitive mind mapping utility on the planet. Beyond that, its user interface looks like something that came straight out of Star Trek, making it the nerdily coolest-looking mind mapping tool I've seen. PersonalBrain organizes your ideas, tasks, and goals in logical connections--not just hierarchies. 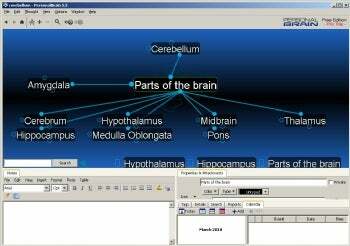 The primary unit of organization in the application is called a Brain (as you might expect). Each Brain is composed of thoughts--essentially, idea components, tasks, or goals--which can be created with a double-click and associated with one another freely. Thoughts connect to one another not merely in a parent-child hierarchy, but can cross-connect to other thoughts. When you click a thought in PersonalBrain, the relationships between thoughts remain intact, while the thoughts themselves shift around: The clicked thought glides to the center of the map, and a little animated circular shape slowly rotates behind the highlighted thought; Meanwhile, its various related thoughts shuffle themselves around in a little dance, to help you better see the connections and make (or break) new ones. The maps' little animations make it useful to visualize relationships between disparate branches of a mindmap tree in a way that 3D Topicscape Pro doesn't accomplish nearly as effectively with that program's cityscape appearance. A basic version of PersonalBrain is free for noncommercial use, but the single installer for the free version also installs the components of (and starts a 30 day trial of) the more fully-featured (and paid) Core and Pro versions, which cost $150 and $250, respectively. The basic, free version of the application lets you create elaborate maps for noncommercial purposes. Business users should pay for the Core application, which also lets you attach files, search Web pages, create Brain templates, and merge two or more Brains into a single file. The Pro version incorporates features that should appeal to businesses, including the addition of sophisticated calendaring functions into Brains, integration with Microsoft Outlook, spellchecking, and the ability to print poster-sized mind maps. At the end of the trial period, you can continue to use or manipulate any Brains you've created, though you won't be able to add more Core- or Pro-level features to them. Support for importing files created in related products is fairly extensive; PersonalBrain can import mind maps created in both the .mmap and .xmmap file formats used by MindManager, and FreeMind's .mm files. It can also import a range of other data sources--including Microsoft Word outline files, or Firefox and IE bookmarks-- and turn them into mindmaps. Users of the Pro version (or the free version before the Pro demo period runs out) can import the contents of entire folders, which will appear as links to those files hierarchically in the existing map.